Thus begins the diversification of my blog. Tomorrow morning, I shall rise (quite) early to begin the 13.5 hour trek to Raleigh, North Carolina for a wedding. I'm incredibly excited for three reasons: one, I'm overdue for a vacation; two, I've never been to North Carolina save for hopping over the state line on the mountainous Appalachian Trail (Tennessee, North Carolina, Tennessee, North Carolina); and three, I finished the bracelet to go with my stunningly simple black, one shoulder dress. My goal was to be "old lady sophisticated." The subdued colors remind me of my grandmother's earrings I would try on while playing dress-up. They also remind me of Neapolitan ice cream. 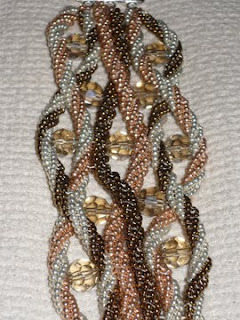 It was made using the "Do the Twist" pattern by Jimmie Boatright in the April issue of Bead & Button Magazine. I should have time in the car to make matching earrings. There's a great line of handcrafted, Tudor-inspired jewelry at The Anne Boleyn Files. I think I may too draw inspiration from our favorite queens for my next beading project. I love the pearl and leaf combination on the Jane Seymour Turquoise Stone Necklace. Fabulous!